Why am I having issues with Lash Extensions? As any Master Lash Technician will know, it takes a huge amount of time and experience to perfect the art of applying lash extensions. All lash techs will run into issues at some point or have that one client who cannot get on with lash extensions. Knowing how to troubleshoot some of the most common issues is essential to lash success and retaining a loyal, regular client base. It is not issues arising that will lose you clients, but how you handle it. Having confidence to demonstrate your ‘know-how’ is essential to ‘saving’ the client and turning around issues into successes. Our blog this week covers some of the most common questions we are asked by our students. My client’s eyes water sometimes during treatment – what can I do? Ensure the eye patches applied are not sitting too close to the underside of the eyelid as this can tickle and cause irritation which the eyes will react to by watering. Slightly adjust the pads if required if their eyes water but ensure the client does not open their eyes at any time during lash application. 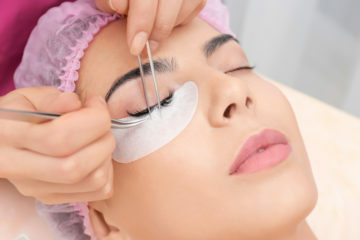 An air blower will disperse adhesive vapours around the eye area during and after application to help reduce the effect of vapours upon the client’s eyes. Products such as LashPerfect Xpel Comfort Gel can help to neutralise the odour from lash adhesive but we recommend simply leaving the lid off the pot and placing ideally near to the adhesive you are working from during treatment. Use of sensitive glues with less vapours (but usually a slower drying time) can help for client’s with particularly sensitive eyes but this will affect the treatment timing (make it much longer) and also make it more tricky to achieve Russian Volume lashes so are usually only suitable for those having Classic lash extensions. My client says their eyes are sore still a few days after treatment – what can I do? Ask your client to return to you so you can look at the lashes further. Most commonly, it may be as simple as one lash sitting too close the lid line which may be tickling and irritating the client’s eyes as with Russian volume lashes, one lash within the fan may be sitting lower or a classic lash may have shifted down following application through too little glue or glue drying before bonded to the natural lash correctly. By carefully looking at the lashes, you may be able to identify the culprit lash and simply remove only that or those lashes. The client should then be able to carry on wearing their lashes without further issues. Ensure you take care to place the false lash(es) 0.5 – 1 mm from the lid line to ensure lashes are comfortable. Adhesive should never be allowed to touch the skin of the lash line. My client says her lashes look like they are drooping or client says they can see them out of the corner of their eye – why is that happening? The simple answer is that most likely the wrong length, curl or thickness of lash has been used. If applying Russian volume lashes, you may have used too many lashes within the fan causing too much weight and which the client’s natural lashes cannot sustain. Ensure you are correctly mapping lashes to suit the natural lash lengths tapering lengths as required considering natural lashes but also the look desired. Don’t be tempted to use lashes that are too long, too thick or too deep a curl as they will not bond correctly or will droop very quickly as the natural lash moves. Applying extremely long lashes to outer corners of the eyes may mean the client can see the lashes in their peripheral vision which can be uncomfortable over time and may drag down the natural lash line causing eyes too look smaller or tired. If the client has many very fine natural lashes mixed within their lashes but wants a more dramatic look, consider taping back some of the natural lashes in sections to reveal the smaller lashes on the underside. Add lighter and/or shorter lashes to these smaller natural lashes to add fullness but avoid overloading the lashes which will cause drooping. For Russian volume lashes, you are looking to use from .03 – .07 mm thicknesses whereas for classic lashes, you’d be looking to use from 0.10 – 0.20 mm depending on client’s natural lashes, look desired and number of lashes to be applied. My client has lost lots of lashes following application – why is this? Natural lashes will shed periodically dependent on the stage within the hair growth cycle that they are at time of application. This must clearly be explained to the client so that they know this is to be expected and not a sign the treatment was not effective and so they don’t worry the lashes are damaged. Clients should be booked for a maintenance treatment for 2-3 weeks from the date of application and this should be booked in during initial application to ensure they keep to the correct treatment intervals. This keeps the lashes looking good, maintains the health and condition of natural lashes and allows you to avoid any issues before they arise such as where a client has not been following homecare advice such as wearing and not correctly removing mascara over the lashes. During maintenance, it gives you a chance to cleanse and clean any natural debris from lashes restoring cleanliness, to remove any stray lashes, to rebalance and infill the lashes to suit the loss of natural lashes and subsequent regrowth. If a client is losing more than 10% of lashes within days of application or only within particular areas such as a noticeable gap appearing, this may suggest there was an issue with the application. The most common issue is the lash tech did not work within the drying time for their adhesive. Lashes should be applied before and held isolated until the full drying time has passed to ensure optimum bond. Applying too slowly (so glue is dry) will mean the bond is poor whereas too quickly (and moving to isolation of the next lash too soon) will mean neighbouring lashes clump together and glue may spread where it shouldn’t. Other issues with bonding may be down to the working environment temperature or humidity or how the adhesive was stored (not within a vacuum storage container, too hot or too cold, or open for too long). Applying lashes that are too long, the wrong curl or too thick can also lead to premature lash loss / poor bond, just as applying too many lashes within a fan for Russian volume than the natural lash can hold. Poor preparation prior to application is also a factor in poor lash bonding e.g. oil remaining on the lashes. 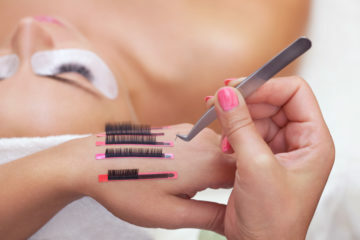 Finally excessive or unexpected premature lash loss can be caused by the client failing to follow the homecare advice such as getting the lashes wet within less than 24 hours of application, using make up on the lashes, trying to curl lashes with a lash curler or lifestyle/medical factors that affect the bond or hair growth cycle such as regular swimmers or those with hormonal conditions. We hope our troubleshooting FAQ this week has been helpful. We will be following up with a further blog helping you to improve your technique and create the best possible looking lashes within the following weeks. Please keep an eye on our blog page for more info or follow us on Facebook to keep up to date! Train as an Eyelash Extension Technician with our Fast Track, Accredited training courses. See suggested courses below or call us on Freephone 0800 999 2277 if you have any questions or need more advice.